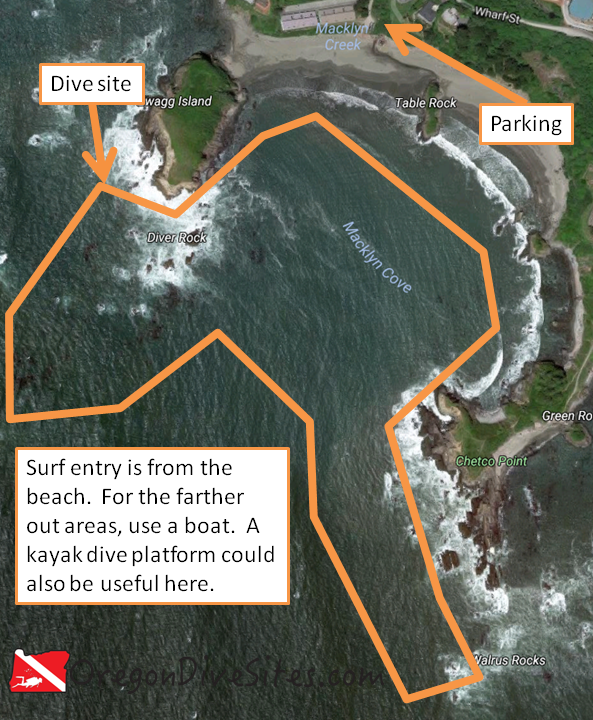 Mill Beach, located between Zwagg Island and Diver Rock on one side and Chetco Point on the other, is a good place to do a surf entry dive in Brookings, Oregon. The scattered kelp makes for a fun area to play and explore, and the rocky cliffs and underwater mounts are a good place to go spearfishing. If you have a boat, the outer kelp forest is easily accessible. Otherwise, a surf-launched kayak SCUBA diving platform would be pretty useful to get further out on this dive site. After a surf entry from Mill Beach, the small cove between Zwag Island and Chetco Point is a good place to play in some kelp. If you have a boat or a shore-launched kaya dive platform, some of the farther out rocks are worth the trip for spearfishing or crabbing. The road down to the parking area for Mill Beach goes right through Brookings, Oregon. Accessing the site is a little challenging. The way we know to get to the little hidden parking lot is as follows: From US101 turn onto Mill Beach Road. You’ll go behind Fred Meyer, past the old mill site, and then it gets a little tricky. Look for Macklyn Cove Drive taking off to the left and turn onto it. You’ve gone too far on Mill Beach Road if you end up in a cul de sac. On Macklyn Cove Drive, look for a left turn driveway. If you end up in front of an apartment complex, you went too far. At the end of the driveway there is a very small parking lot. The last time we were here, parking was free but very limited. Be sure to check the signs and be sure to not block anyone in. If it’s a popular weekend for SCUBA diving, it’s a good idea to show up a few hours before the tide to snag a parking space. The site is centered around Macklyn Cove and anchored between Zwagg Island and Diver Rock on one side, and Chetco Point on the other. Table Rock is in the middle of the beach. navigation here is a little more complex than diving on jetties in Oregon. You need to pay attention to where you are in the site. The beach spans the north and north-northeast portions of the site. This is where you do your surf entrance/exit. If you’re on a boat, then be sure to know where you are in relation to your boat. If you’re shore diving this site, generally we’d suggest you stick between Diver Rock and Chetco Point, and not go outside of the cove. The swim is lengthy otherwise and there is plenty to see inside the cove. The site is big enough that it takes 2-4 dives to cover the whole place unless you’re going on a speed tour. There are plenty of wildlife viewing opportunities and we’ve seen people spearfishing here. If you’re shore diving, you have a surf entrance to deal with. Be sure you have surf entrance/exit training and it’s not a bad idea to practice the drills before you head out. Down in California at Monastery Beach near Monterey, SCUBA divers die every few years because they panic during rough surf exits and drown within 20 feet of dry land. If you’re boat diving, you will probably be anchoring at the southern or western edge of this dive site. In that case, you’ll be dealing with a boat entry and exit. You can dive this site either from shore or from a boat. While the cove is fairly protected, you need to be ready to deal with surf, surge, and a little current. If a storm is coming in, don’t bother with this site. Be prepared to do an army crawl out of the surf if conditions deteriorate while you’re diving. It’s not a bad idea to survey the whole beach when you surface to see if there is one area that is less rough than the rest of the beach. We generally try to surface with plenty of reserve air in our tanks in case we have to army crawl on our bellies through the surf zone to safely exit. Depending on ocean conditions, you’ll have anywhere from almost no visibility up to 25+ feet of viz. The further away from shore you go, generally the clearer it gets. Water temperature here can vary from 45F at the extreme cold end to 57 or 58F on the extreme hot end. You can dive Mill Beach almost any time of the year although storms and ocean conditions really dictate when you can dive here. At the deepest part of the site in the middle of the cove, you could find about 60 feet of water. Along the edges, expect more in the 25-30 foot range. Be sure you have surf entry and exit training. Be sure you’re confident in your navigational skills. Advanced open water training is a good idea here. We rate this as an intermediate dive as far as shore dives go but if conditions are bad, this can be a very advanced dive. Assuming you can find parking in the parking lot, you’re looking at between 200 and 1000 feet of walking to get to a good place on the beach to enter. You will want to kick out 200-300 feet to get beyond the surf zone and into deeper water before you descend. This site is exposed to the Pacific Ocean. Especially as you get to the tips of the points of land jutting into the ocean, you will be exposed to whatever the ocean is doing that day. Be sure you know how to dive in these conditions. We aren’t aware of any reasonably close dive shops to this site. There is an air fill station up in Depoe Bay and the Medford area has a dive shop but otherwise we haven’t found any nearby shops in Brookings or further south in California. Let us know if you know of one. We have never eaten in Brookings so we can’t comment on the restaurants. Please let us know if you know of somewhere good to eat. We haven’t stayed in Brookings before. Let us know if you know of a good campground or a SCUBA diver friendly hotel near Mill Beach.